Here’s something I found out about at Taste of the Nation. Thanks to Friends Health Connection and the Mercer County Community College Hospitality Club (they had a table at Taste with brownies and adorable red velvet cupcakes), celebrity chef Cat Cora visits our area on June 2, for a book signing and tasting event at the Hamilton Manor. 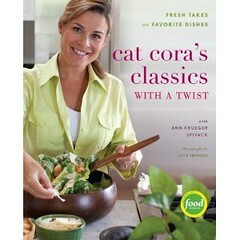 The bargain price of $39 per person (plus ticket fees) includes a copy of Chef Cora’s new book, Cat Cora’s Classics with a Twist, and a tasting portion of one of her recipes prepared by Chef Frank Benowitz & the MCCC Hospitality Club. Tickets may be purchased through MCCC’s Kelsey Theatre at (609) 570-3333 or online. A portion of the proceeds benefits FHC and the MCCC Hospitality Club.